Latest update: 24th October 2018. Birmingham Corporation’s guide to ‘bus, tram and trolley-bus travel. The cover remained unaltered from the 1930s until the end of the trams. Some of my earliest memories are of travelling on Birmingham’s trams. My mother would take me shopping in the city centre almost every week even when I was only three years of age. By the time I was six I was using the trams daily for my journey to school – about a mile from the terminus of the Washwood Heath 10 route as far as Ward End Park. When I was eleven I transferred to King Edward’s School in Edgbaston and for a year the Bristol Road trams were my daily route to school until those routes were replaced by ‘buses in July 1952. The first Corporation electric trams were introduced in 1904 and the system built up to reach a total of over 80 route miles by 1930, after which decline set in, with the last tram running on 4th July 1953. 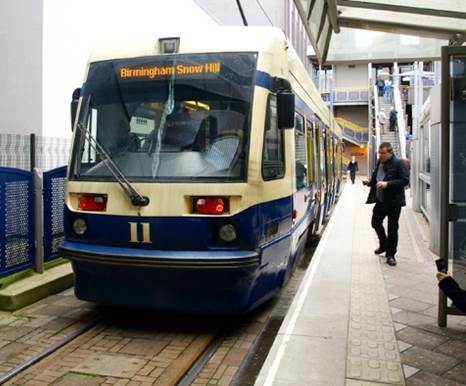 Birmingham’s tram system was built to an unusually narrow gauge, only 3’6”, which seemed to give the city’s trams a slender grace and feminine elegance lacking in the rather dumpy looking trams of London and most other cities. In total, Birmingham had 843 trams (although not all of those were in service at the same time). Those up to number 511 were mostly four-wheeled cars built before 1913 with open tops which were later covered in although retaining open balconies front and rear. 512 – 636 were bogie cars built in 1913 and 1920 with covered tops and open balconies which were later closed in. Those numbered from 637 onwards were bogie cars built from 1923-1930 with totally enclosed upper saloons. 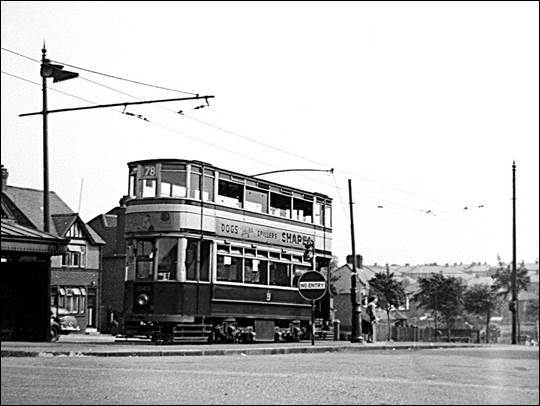 No 792 (built 1928) in Washwood Heath Road in 1950, clearly showing the bow-collector. Tram ticket to school! (An anonymous photo from the family archive) (More tickets below). With school friends, I started collecting tram numbers on my journey to and from school from 1946. I soon found that just the numbers 762 – 811 kept recurring, but 785 was never to be seen. 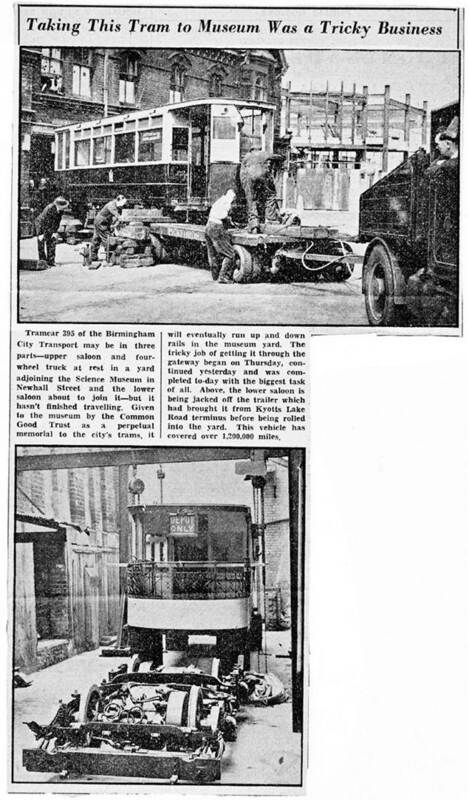 The explanation was that those were the only trams fitted with self-reversing bow collectors for current collection and they were allocated to the Washwood Heath depot. 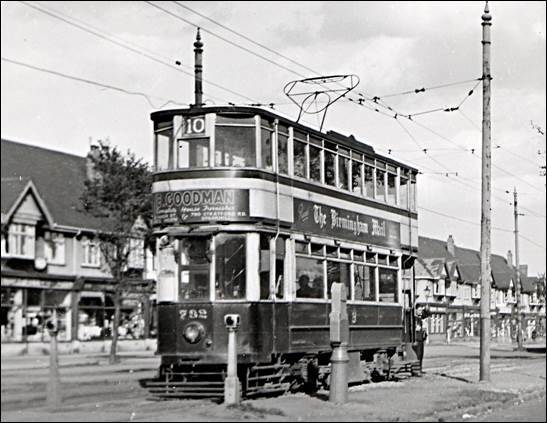 The overhead wires were so arranged that other trams with conventional trolley poles could only be run at some inconvenience to the operating staff. 785’s absence was the result of a direct hit in an air raid in April 1941. As children we soon identified the individual personalities of each tram. 805 had a stiffness in its bow collector which affected its ability to reverse automatically: this meant that the collector did not reverse until it encountered an irregularity in the overhead, at which point it would reverse violently, slamming on the tram’s roof to the alarm of passengers (and incidentally providing a good display of sparks after dark). Trams built after WW1 generally had attractive decor inside, the maple finish to the ceilings being particularly smart but for some reason 797 was chosen to have its ceiling painted cream. Certain trams could be identified by combinations of colourful advertisements on the outside. Most trams had patterned moquette seat covers in the lower saloon and brown leather seats upstairs, (just occasionally dark blue). 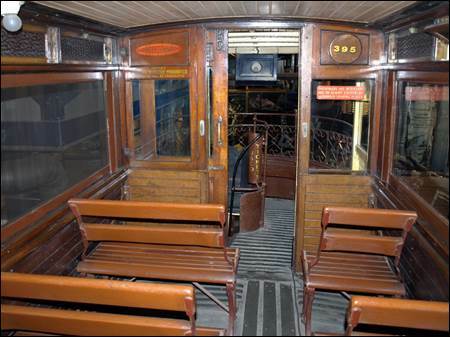 Some surviving older trams retained reversible wooden seats on the upper deck. Even the arrangement of seats either side of the aisle varied and was duly noted by our youthful minds. The glass window in the sliding door separating the platform from the lower saloon was always painted black (so that the interior lights did not distract the driver at night) with a key pattern advertising the Birmingham Municipal Bank. Sometimes trams would disappear for a while and we would worry about the absence, but then the old friend would reappear resplendent in new paint and, for a while, lacking any advertisements. I particularly recall 762 being missing for a long period and have since ascertained from archive records that it was taken out of service in November 1948 and reappeared the following March after overhaul! In the post-war years the volume of passenger traffic on the trams and ‘buses was growing rapidly. Thus, when tram routes were replaced by ‘buses, not all the old trams would be scrapped. The best of the redundant vehicles would be sent to reinforce other routes. 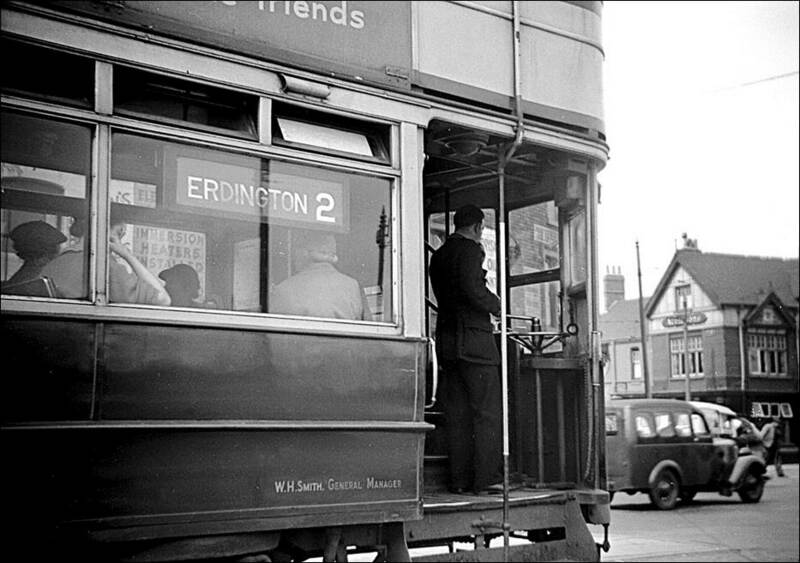 In October 1948 several elderly four-wheeled trams with open balconies, released on closure the services to Stechford, were transferred to Washwood Heath depot to help 762-811 cope with the traffic volumes. The open balconies were a special delight for us school children, though older passengers viewed things differently on cold, wet mornings! My first ride on one was on 321 on a morning of frost and fog early in November 1948. These elderly interlopers were still fitted with trolley poles instead of bow collectors and it meant that at certain junctions it was necessary to stop the tram and for the conductor to transfer the trolley pole to a separate wire. 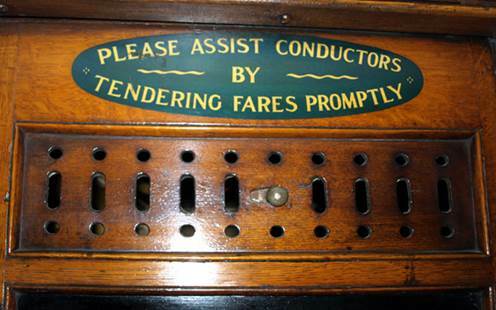 Conductors also had to remember to attend to the trolley pole at the terminus, as forgetting to do so was disastrous! I witnessed such an incident, not with one of the old open-balcony cars, but with Washwood Heath’s own 779 which was equipped with a trolley pole shortly before closure of the route, in readiness for transfer to the Bristol Road routes. But the crew were clearly ignorant of this change and I watched with amazement as 779 set off from the terminus with its trolley pole on the wrong wire. After only a couple of hundred yards it hit a tram coming the opposite way: 779 was dewired, the electric flash severing the trolley rope. I wanted to stay and see the fun, but I was with my mother who had ‘more important things to do’. Withdrawal of the Washwood Heath route was a sad event in my childhood: my first bereavement. My last journey home from school on 806 still stays in memory and on the Sunday morning following closure I cycled to the terminus, noticing that already the rails were starting to lose their shine. I prefer to look back to carefree journeys on sunny afternoons, when I rushed home from school with friends, an Arthur Ransome novel from Ward End Library in my satchel, looking forward to Children’s Hour on the BBC Home Service. long-defunct Birmingham Gazette. The tram, no 309, was built in 1911. 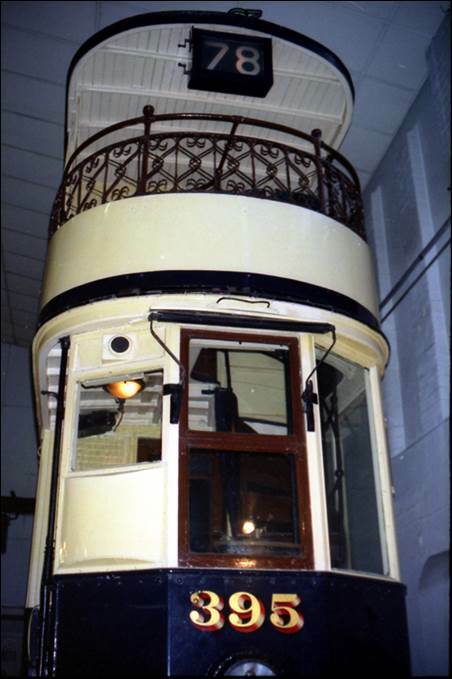 This was the very last public working of an open balcony tramcar. 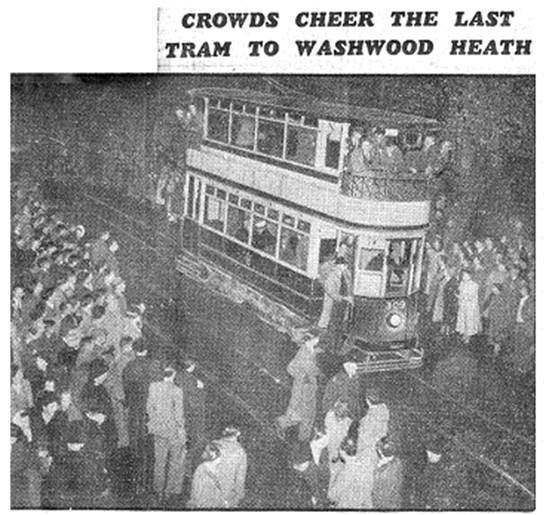 On closure of the Washwood Heath routes in October 1950, the last of the old open balcony cars were scrapped (apart from 395 – see below). 309, the last service car into the depot and the oldest in the fleet, suffered the ignominy of being promptly turned round and driven across the city in the small hours to Witton for breaking up. But, happily, the 762-811 series were transferred to Selly Oak and Cotteridge depots to augment services on the Bristol and Pershore Roads, including the popular day-tripper route (Rednal 70) to the Lickey Hills. I was thus delighted to renew acquaintance with my old friends when I started travelling across the city to school in Edgbaston. This provided a memorable incident on 20th March 1951 when a power failure caused the suspension of services in the morning rush hour on the very day I was taking the school’s admission examination. Although I reached the school without problem, my mother, who had taken me on this momentous journey, had to walk back into the centre of Birmingham. 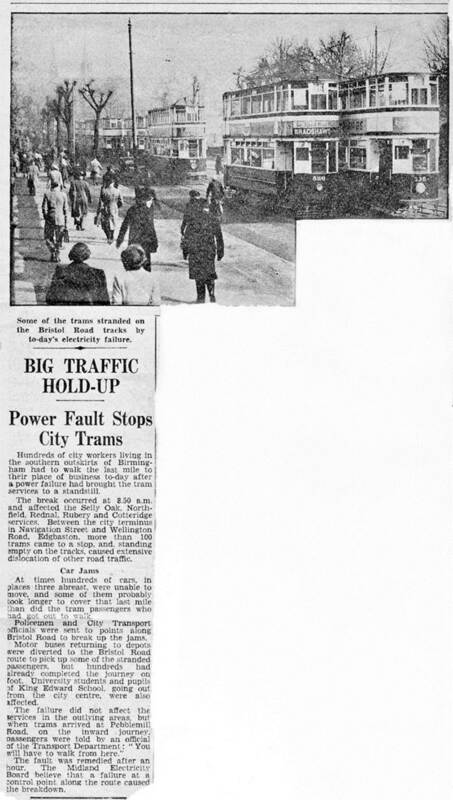 The press cutting copied further below gives an idea of how many trams there were in use in those days: private transport was almost non-existent: everyone went by ‘bus or tram. Once settled in at the school, I enjoyed my daily tram rides until they too were ended by withdrawal of the service in July 1952. Features of both the Bristol Road and Lichfield Road routes (and also, before the war, of the Dudley route) were the low bridges at Selly Oak, Aston and Dudley Port railway stations. 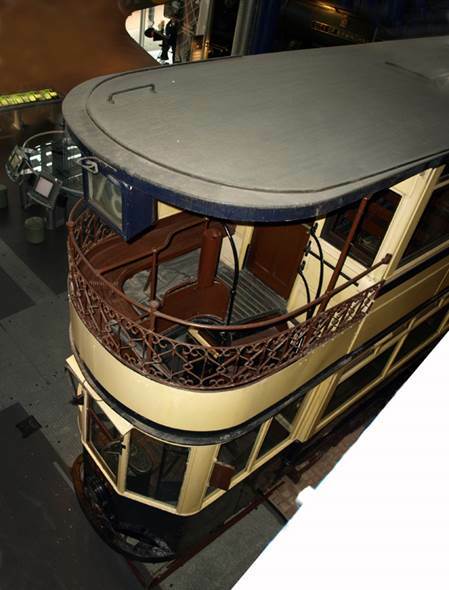 There was insufficient clearance above the roof of the tram for the trolley wire which was instead carried to one side at a height level with the tramcar roof. It was fascinating to watch from the upper deck as the trolley pole swung to one side and gracefully dipped down as the tram proceeded under the railway bridge. Needless to say, bow collector cars were precluded from working such routes. Major tram overhauls were carried out at the works at Kyott’s Lake Road, off Stratford Road. Transferring a tram to or from the works was quite indirect as there were no routes crossing the centre of Birmingham. When the lines were built the Corporation was anxious not to sully such central thoroughfares as New Street, Bull Street or Colmore Row with rails and wires, so trams turned via loops in streets on the fringes of the centre. Connections between the various routes were made by links just outside the centre which often involved quite devious journeys. 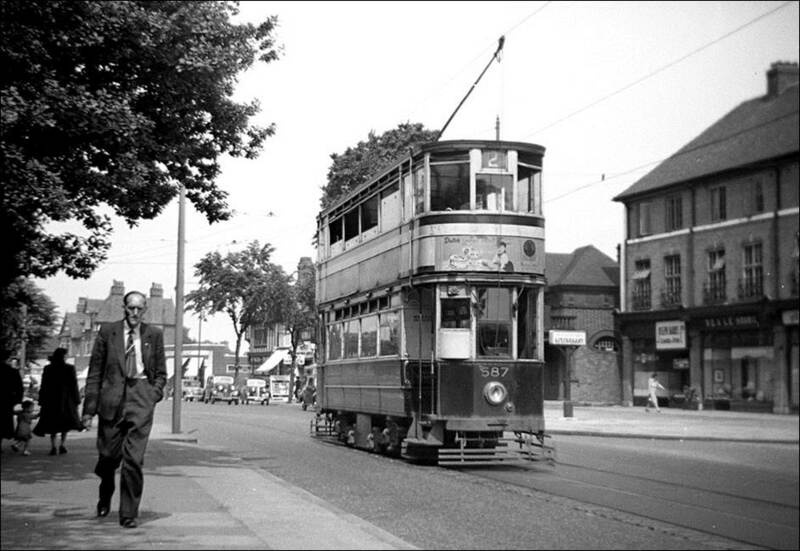 With the imminent closure of the system, major overhauls of trams ceased in July 1952. The last trams to receive full overhauls with complete repainting were 555, 758, 795 and 796 in July 1951. Thereafter routine maintenance with revarnishing of existing paintwork continued as considered appropriate. It must be stressed that there was no falling off in standards: the permanent way and cars themselves all were maintained in splendid condition until the final wind down to closure. With the sunlight shining on their smart paintwork and interior woodwork on the polished woodwork, Birmingham’s trams remained a credit to the city right into 1953. 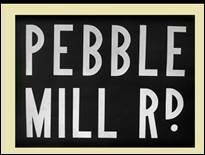 The links between the various routes were also used on summer weekends and Bank Holidays to supplement the popular Rednal 70 service to the Lickey Hills by running trams based at depots elsewhere in the city. Thus, for example, trams would run through from Witton to Rednal, taking the usual 3x route as far as Dale End. 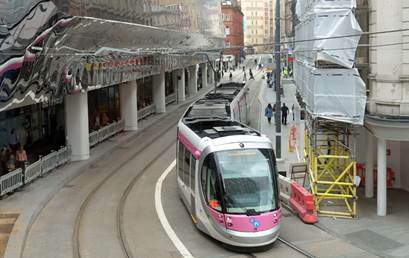 There the tram would diverge to High Street, reverse and proceed via Albert Street, Moor Street, Digbeth, Rea Street, Bradford Street, Moat Row, Bromsgrove Street, Hurst Street and Hill Street to reach Navigation Street. Here the car would reverse once more to take up the normal route of the Rednal service. One suspects that a through passenger could have alighted in Dale End, had a leisurely walk to Navigation Street and got on a normal 70 tram to Rednal, long before his tram from Witton would emerge from Hill Street! A cutting from the Birmingham Mail describing the incident on 20th March 1951 mentioned in the narrative above. Note the number of stranded trams – and the unusual number of pedestrians! A photograph taken by the Birmingham Post & Mail about 1948 showing a summer evening at Rednal terminus. 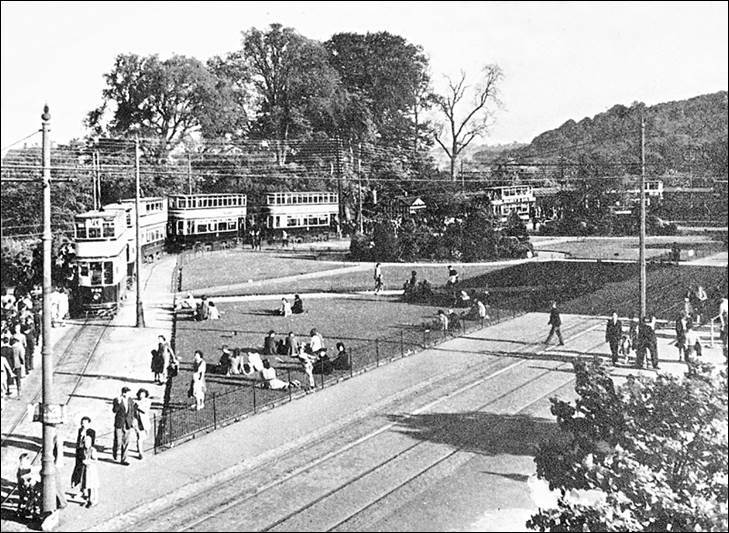 Day trippers queue at the extreme left of the photo to join the line of trams waiting in the loop to take them back home after a day on the Lickey Hills. The tram at the left appears to be 755, built in 1926. Further forward are two trams from the 812 class dating from 1928 and fitted with eight side windows in the upper saloon. The 812 class were allocated to Cotteridge depot for the Pershore Road route but were used to augment services on the Rednal route at busy times. Just to the right of the shrubbery a 4-wheeler with open balconies can be glimpsed, probably one of the 301 class dating from 1911. No 800 had been allocated when new in 1928 to Washwood Heath depot where I became familiar with it on my journeys to school in the 1940s. On closure of the Washwood Heath and Alum Rock routes in 1950, 800 was initially transferred to Cotteridge depot. 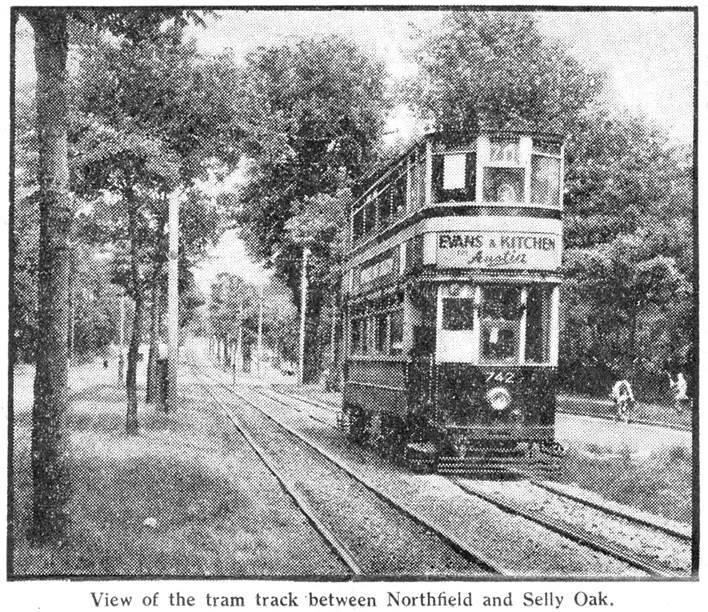 During the last two years of its life it also worked from Selly Oak before becoming the last car into Cotteridge. 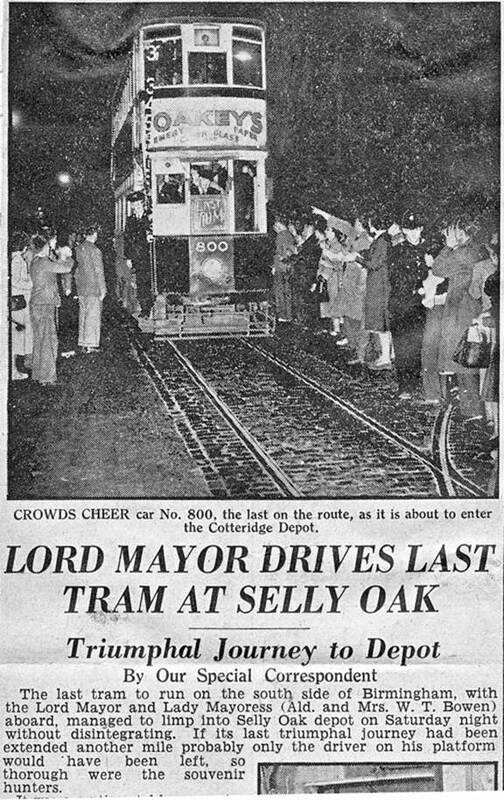 The last tram into Selly Oak depot the same evening was 777, another former Washwood Heath car. 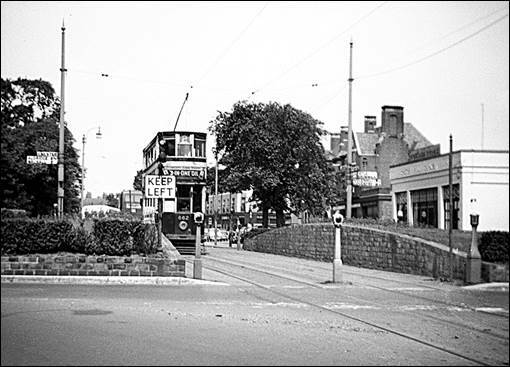 Closure of the Bristol Road routes in July 1952 left just three tram routes operating in Birmingham: Erdington 2, Short Heath 78 and Pype Hayes Park 79. They lingered on for another year, finally succumbing on 4th July 1953. By good fortune, I was given a Kodak Brownie Box Camera for my 13th birthday on 23rd June, so on Saturday, 27th June I spent the afternoon travelling those three routes and taking the photographs which appear below. 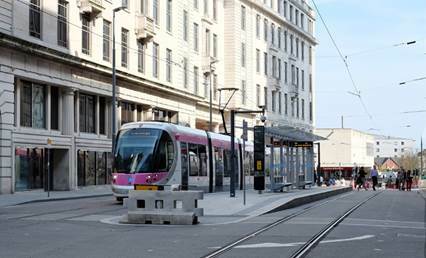 The last trams were scheduled to run with due ceremony mid-morning on Saturday 4th July for the delight of the public – but I was otherwise engaged with a French lesson at school. So, on the Friday evening I detoured significantly on my way home to secure a final ride and on Saturday morning, en route to school, I had a last peep at operations in Steelhouse Lane, city terminus of the three final routes. By Saturday afternoon, the trams had vanished from the streets, but the rails still shone from their use earlier in the day. Late on Saturday evening the trams took their final unadvertised bow as cars were transferred from the depot at Miller Street, Aston, to the works at Kyott’s Lake Road for dismantling. This involved a strange, almost symbolic operation. The overhead wires had already been removed from the slope down Carrs Lane in the city centre. 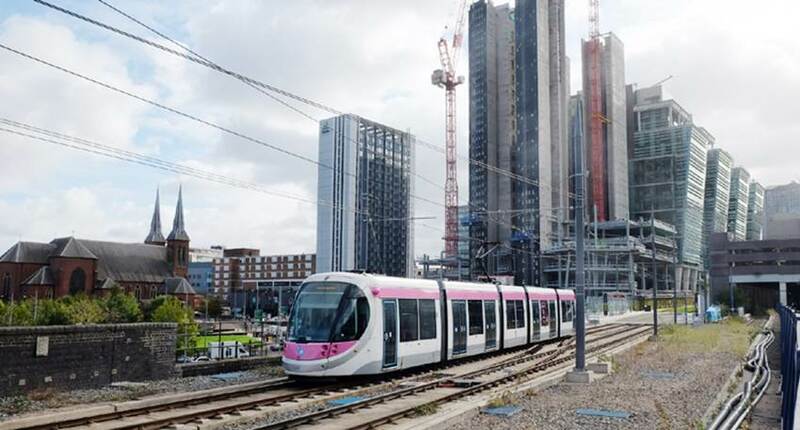 Thus, each tram made its way under its own power to High Street, then coasted gently downhill at Carrs Lane, a journey with no possibility of return, before connecting to the overhead in Moor Street for the last run through Deritend and along Stratford Road for breaking up. A sad end for a system which had transformed the lives of Birmingham’s citizens. 587, built in 1920 with open balconies, waits in Sutton Road, Erdington, to pull forward into the terminus prior to returning to the city centre. Trams of this type were equipped with two 63 h.p. motors giving good acceleration. Such performance (and the consequent braking) caused wear on the bodies and by the late 1940s it was necessary to strengthen the bodywork. As can be seen in the photograph, this involved fitting 1/4” steel plate on the bulkheads separating the passenger saloon from the platform, thus eliminating the usual window. 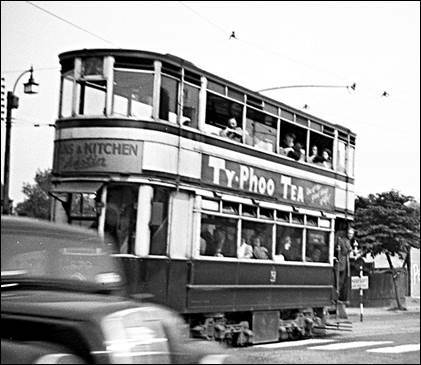 Photographed early on Saturday afternoon, 27th June 1953 when the trams had just a week to survive. 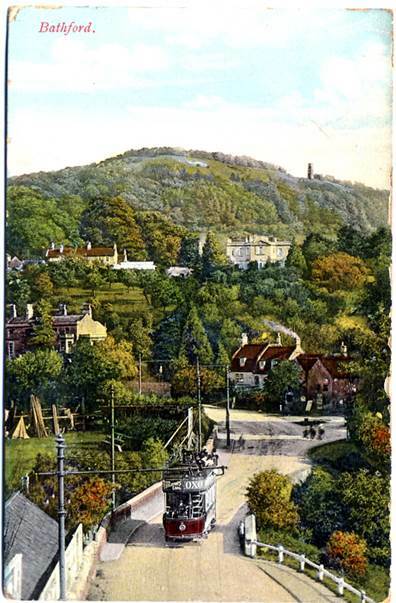 Compare with these two postcards dating from about 1907 and 1919 respectively. At the left car 233 waits at the terminus; at the right car 318 is waiting. The buildings at the right of these photos are just beyond 587 in the photo above. The large tree at the right of the old photos can be seen above 578’s roof. Car 233 entered service in April 1907 and was superseded on this route in 1911: in the photograph the paintwork looks brand new. 233 was later fitted with a top cover (but retaining open balconies) and was withdrawn from service in 1933. In the second photo, a shield can be seen on the overhead, preventing sparks from being seen by marauding Zeppelins during the war. Such shields were installed in 1917 and were removed soon after the end of the war. Tram 318 survived until November 1948. (I am indebted to Peter Jaques for help in dating the two postcards). Left: 662, built in 1923, passes through the Chester Road traffic island as it approaches the Erdington terminus. Right: Nearly missed: a Morris 8 nips between my camera and 679 as it approaches Gravelly Hill on the 79 route from Pype Hayes Park. Upstairs, passengers have the windows right down to enjoy the fresh air, and another passenger leans from the platform as he prepares to alight. 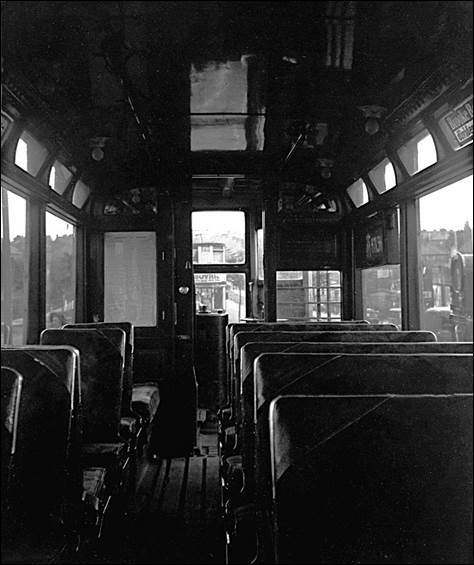 Lower saloon windows could not be opened, but on summer days the driver would often leave open the sliding door to the passenger saloon ensuring a through current of air. The platform of a tram about to start from Gravelly Hill for Erdington. The driver stands at the controls – an uncomfortable and draughty position, but acceptable in the first half of the 20th century! The brake handle is in his right hand and his left hand would be on the power controller which is almost hidden from view. Note that the lady passengers all wear hats. On the side of the tram the General Manager’s name has clearly been changed from the longstanding A.C. Baker who had died in July 1950. The area of this photo is now covered by the M6 Motorway interchange. Tram interiors: lower and upper decks. The lower deck (car 649, photographed at Short Heath terminus) shows the narrowness of the vehicle with single seats one side of the aisle. To the left of the door to the platform is the notice listing speed restrictions and various operational prohibitions. Unlike 587 shown above, this car retains the bulkhead window to the platform as it was fitted with 40 h.p. motors which did not cause as much wear as the more powerful equipment and body reinforcement was unnecessary. The upper deck picture (car 662, photographed at Erdington terminus) shows the reversible seats and also the longitudinal seat (on which the lady passenger is sitting) adjacent to the closed in stairway. Note the match striker plate screwed to the pillar at the front. The destination indicator box is just visible above. Note also the decorative moulded ‘china’ light fittings and the high gloss maple ceilings. Downstairs upholstery was in brown patterned moquette; upstairs was leather - usually brown, occasionally dark blue. The Steelhouse Lane terminus near Snow Hill station. Car 725 (built in 1926) is ready to depart on route 78 to Short Heath. Beyond is the Gaumont Cinema, now also a memory. This whole area is now pedestrianised and given over to modern office blocks. Two views at Short Heath terminus, later on the afternoon of Saturday, 27th June 1953, showing the reserved formation once typical of many modern dual carriageway roads in Birmingham. Left: 725 awaits passengers while 649 awaits its turn to pull into the terminal stub. 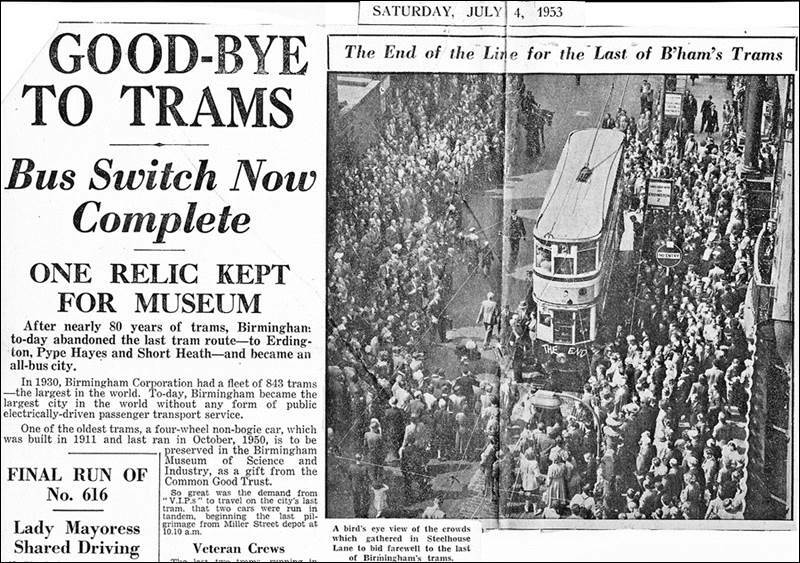 Part of the front page of the Birmingham Mail for Saturday, July 4th 1953, describing the run of Birmingham’s last tram. The change-over was scheduled for mid-morning, so that most citizens could witness the event. In clockwise order around the city, starting in the north. 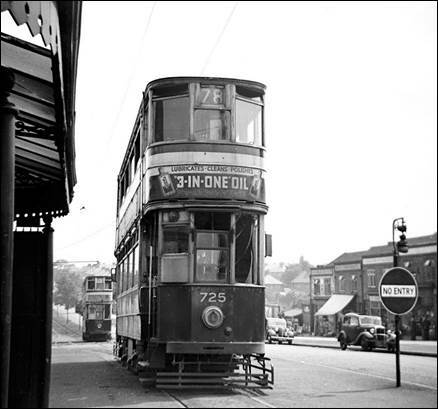 # - Route 1 became a short working of the 78 in 1926 on extension of the line to Short Heath. Route 35 became a short working of the 69 in 1923 on extension of the line to Northfield. Routes 35 and 69 became short workings of the 70 and 71 in 1924/26 on extension to Rednal and Rubery. 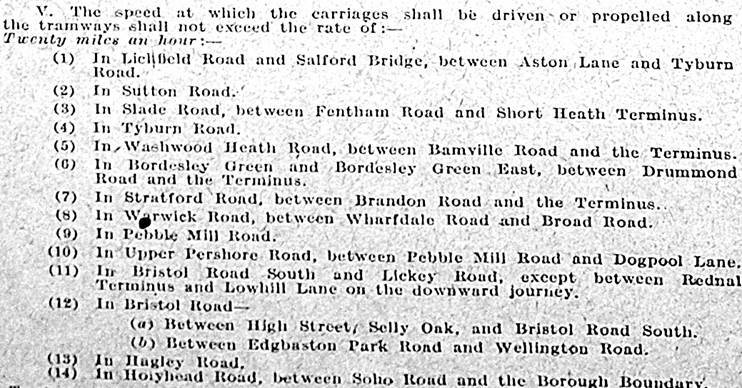 Routes 11 and 12 became shortworkings of 90 and 84 in 1928 on extension of the line to Stechford. Routes 24 and 25 were operated as one continuous circular route until withdrawal of the 25 in 1933. All numbers 1-91 were used for routes: those not listed above were mostly short workings turning back before the final terminus. 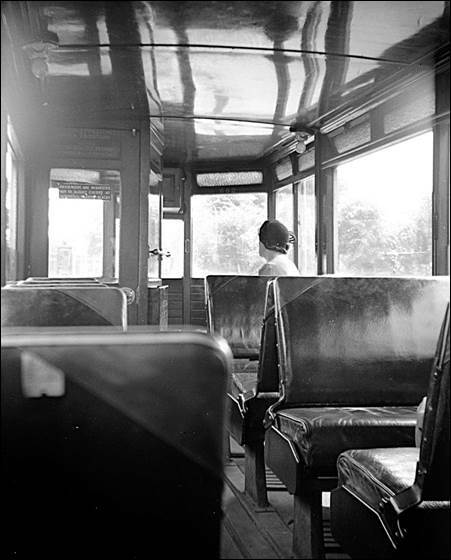 Route 7 and the 15 and 16 were converted to trolley-bus operation in 1922 and 1934 respectively. The 7 was converted to motor-bus operation in 1940 and the remaining trolley-bus services ceased in 1951. Except for those distances marked “est”, I am indebted to Geoffrey Skelsey for the mileage and timing details which he extracted from official Birmingham Corporation Tramways & Omnibus Department records published in the 1930s. 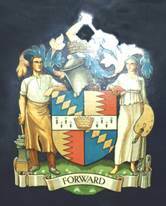 73-77 and 80/85-88 were Black Country routes taken over by Birmingham Corporation in 1924 and 1928 respectively. 70-71, 78 and 84/90 were extensions of existing routes as shewn in the table above. 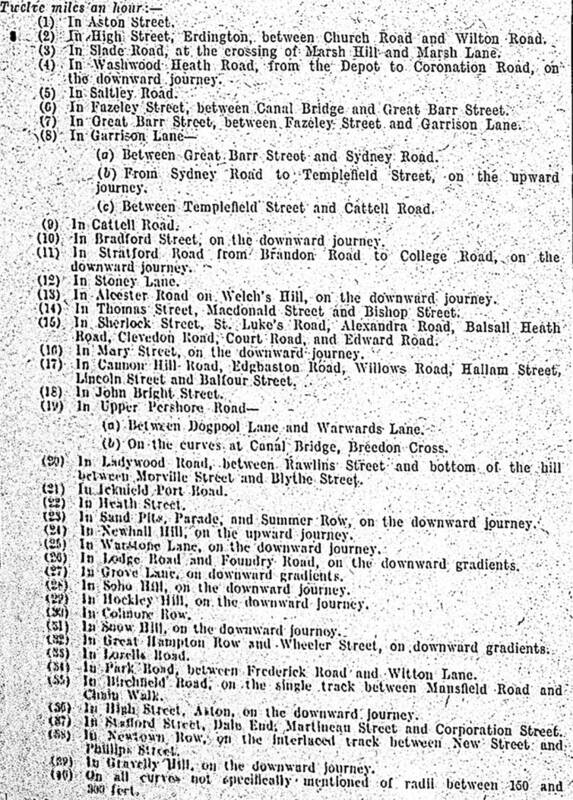 79 was a new route partially opened as the 63 in 1920 on construction of Tyburn Road and numbered 79 on completion of the route to Pype Hayes Park in 1927. A selection of tickets, issued on the Washwood Heath 10 tram route in 1948-1950. In the top row, the ½d and 1d child’s, 2½d and 3d tickets were issued on the 10 tram in 1948 and 1949. Note that the printing shows “Birmingham Corporation Tramways and Omnibus Department” and the price is printed in small digits. The 1½d and 2d tickets date from 1950, showing instead “Birmingham City Transport” and with the price printed with large digits. Longer routes in Birmingham had larger ranges of tickets up to higher values, but those illustrated sufficed for the Washwood Heath and Alum Rock routes. The tickets in the second row were issued from prototype Ultimate machines first introduced experimentally at Washwood Heath depot on 10th February 1949. There was no 1d ticket: for the penny child’s fare two ha’penny tickets were issued. Later ‘production run’ Ultimate tickets had three boxes across the lower part of the ticket, for ordinary, children’s and workmen’s return fares. The bottom row shows a typical advertisement on the reverse of a standard bell punch ticket. 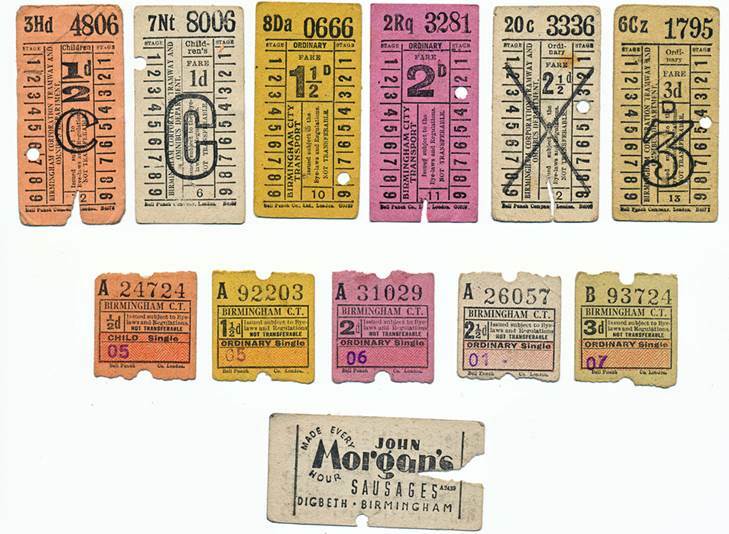 There is a tale, probably apocryphal, that Morgan’s sausage factory in Digbeth also bore the same slogan which appears on the ticket: “MADE EVERY HOUR”, constructed from separate letters. Apparently, the last letter of the first word dropped off, leaving a rather different slogan! Inflationary note: In 1950 the full journey of four miles from the Fox and Goose at Washwood Heath to the city terminus in Martineau Street cost 3d for an adult and a penny for a child (then 240 pence to the £), equivalent to 1.25p and 0.4p respectively in current decimal currency. To adjust for inflation from 1950 to 2013 one should multiply by a factor of 28, so that the equivalent adult fare in 2013 should be 35 pence: it is in fact now £1.90! 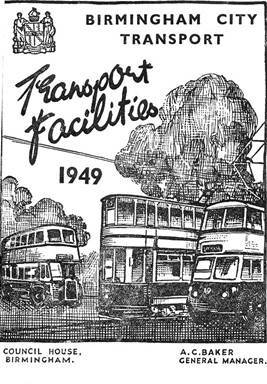 There have been several fine books published on Birmingham City Transport. 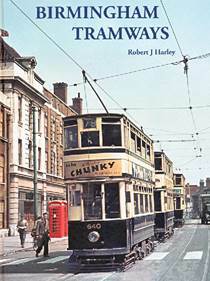 Birmingham Tramways by Robert J. Harley, 208 pp, (East Sussex: Heathfield Publishing, 2017). This is a beautifully produced book, well illustrated, with a good historical survey of the network from the horse drawn trams of the 1870s through to closure of the electric network in 1953. (But see note just below). Camwell’s Birmingham, edited by Peter Jaques, 112 pp (Droitwich, Kithead Limited, 2007) contains a fine selection of photographs with trams, buses and trains in Birmingham. The photos were all taken by W.A. Camwell (1906-1995) one of the leading transport photographers from the 1930s to the 1970s. Readily available online. A Nostalgic Look at Birmingham Trams 1933-53 by David Harvey, 3 vols of 100 pp each, (Peterborough: Silver Link Publishing Co 1993-5) offers the most complete pictorial survey with excellent photographic coverage of each route in turn. Now out of print, but usually readily available online at Abebooks at affordable prices. Birmingham Corporation Tramway Rolling Stock by P.W. Lawson, 212 pp, (Solihull: BTHG 1983) provides a highly detailed, lightly technical account of the trams themselves. The author was the Superintendent of Kyott Lake Road Works where the city’s trams were maintained. Each class is listed and described in turn with generous illustrations. Also out of print but can be found online at Abebooks. Note regarding Mr Harley’s book, listed above. Cover photo: This shows Aston Street alongside the Central Fire Station on 24th May 1952. Photo by C. Carter. The book cover is copied below. 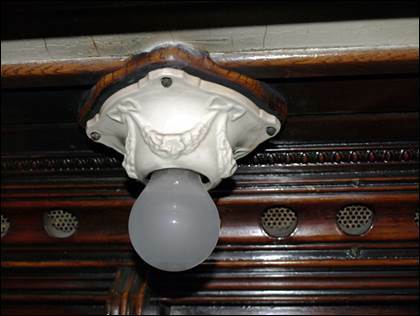 P.17: The photo is in Colmore Row by the Great Western Arcade entrance. The trace horses are being removed after climbing Snow Hill. P.18: The photo was taken in 1906. The line did not continue any distance up Nechells Place – it was merely a turning loop. P.27: The photo was taken at Six Ways, Aston, not Aston Cross. Pp84/5: In Birmingham bow collectors were not normally ‘flipped over’ at termini by means of the rope attached; they were considered to be self-reversing. To aid reversal, the overhead at termini was raised slightly so that the bow was almost vertical. Manual reversal normally occurred only when reversing at intermediate crossovers or if the motorman knew of a potential problem. Pp85,121: At the low bridges at Aston, Selly Oak and Dudley Port the overhead was taken well to the side of the car, thus precluding the use of bow collectors. The wires were sufficiently far from the car for there not to be any danger to passengers leaning out of the windows in a normal manner. P.86: Where the city terminus was on a loop, passengers alighted by the front (driver’s) platform while joining passengers entered the car conventionally at the rear. This speeded up the process considerably. Pp92-95: The BCT maps date from 1925 and 1934-36 respectively. 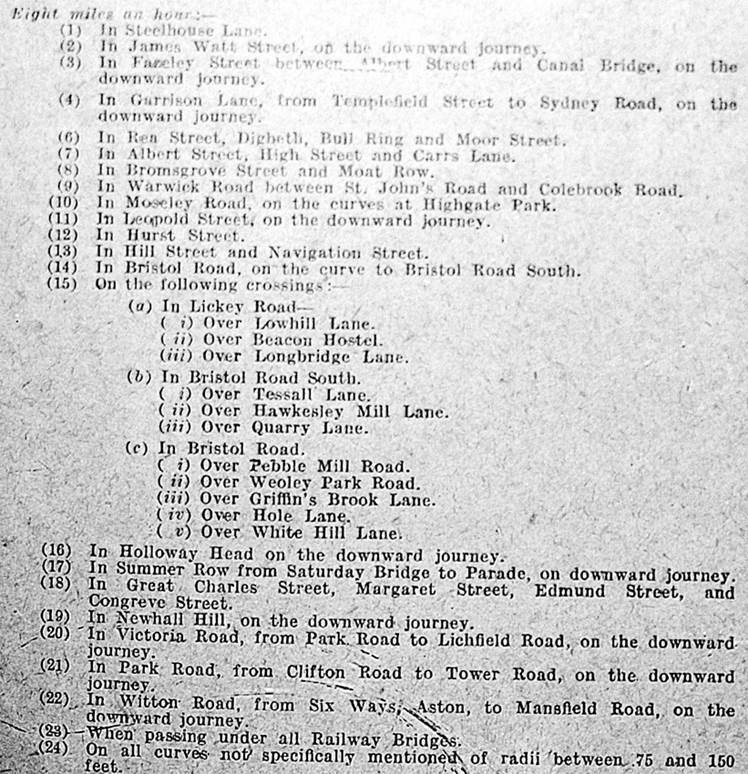 P.96: Under July 1952, add Pershore Road to the list of closures (replaced by bus 45). P.116: The cause of the accident in Saltley was an epileptic fit suffered by the motorman of car 776. P.148: The obstacle to use of trolley poles on route 8 was the wiring arrangement at the junction in Saltley which required re-poling by the conductor. The last car into Washwood Heath depot appears in photographs as 309 (then the oldest car in the fleet) not 357. P.161: The photograph is not Pershore Road but Suffolk Street: car 797 has just left the Horsefair in 1951 or 1952. The striking front of 395, built in 1911 and withdrawn from service in October 1950 after covering 1,200,000 miles in the service of the citizens of Birmingham. The photograph shows the open upstairs balcony with slatted wooden seats, popular with school children - if with few others, as it could be a damp and chilly perch in inclement weather! This photo was taken in 1995 when 395 was still in the wonderfully evocative Georgian museum building in Newhall Street where admission was free. Since then the museum has moved to the austere modern “Think Tank” museum east of the city centre where the following photographs were taken with the kind assistance of the “Think Tank” museum authorities. 395 was one of a hundred cars of the 301 class, which entered service between April 1911 and February 1912. The car is equipped with two 40 h.p. motors. 395 is 29’9” long, with a width of 6’3” and a height of 15’7½“, weighing 12 tons 15 cwt. Headroom in the lower saloon is 6’3” and in the upper saloon 6’0”. 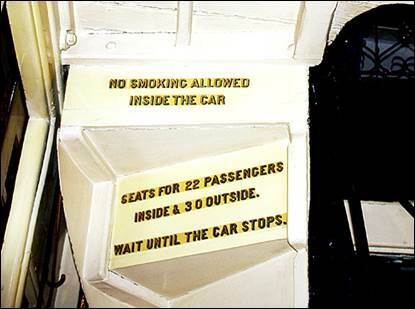 Seating on the lower deck was initially longitudinal, but changed to transverse, following which the total seating capacity of the car was 52 passengers. Over its life 395 operated across much of Birmingham. It worked on the short-lived Hagley Road service for a time and, inter alia, was subsequently at Selly Oak depot from whence it would have operated on the Bristol Road and Pershore Road routes, including the busy holiday workings to the Lickey Hills. After the war it worked from Coventry Road depot on the Stechford services until their closure on October 2nd 1948, and later from Witton and Miller Street depots on services including Perry Barr and Erdington until its withdrawal on 29th September 1950, after which it was transferred to Kyotts Lake Road where for a time it enjoyed occasional use as a depot shunter. Finally, it was given a last renovation prior to its move to Birmingham’s Science Museum in June 1953. For comparison, the totally enclosed bogie cars built from the mid-1920s were equipped with two 63 h.p. motors, offering faster and smoother running. The bogie cars were fractionally longer at 33’6” with the weight increased to 16 tons 15 cwt. Headroom in the upper saloon was reduced to 5’10”. Seating was provided for 60 passengers. 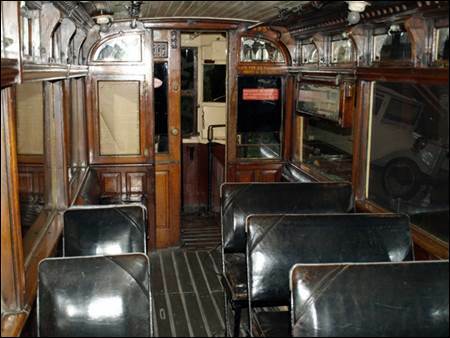 The left hand photograph shows the lower saloon, equipped with reversible seats upholstered in dark blue leather. The sliding door to the platform is partly open. 395 retains the original lath ceiling. From the 1920s newer cars were furnished with attractive veneered maple ceilings incorporating a floral motif and seats in the lower saloon were upholstered with brown moquette. Note the small quarter-segment mirrors just below ceiling level on the bulkheads of the lower saloon. 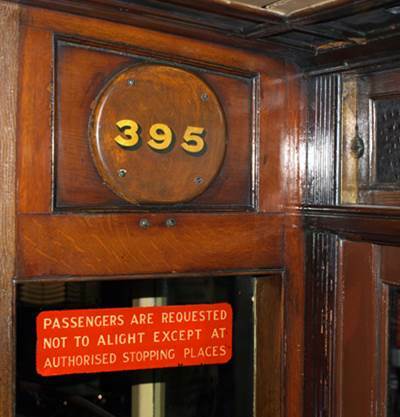 The right hand photograph shows 395’s upper saloon (officially referred to as ‘Outside’, because on the earliest trams the upper deck was open to the elements). The car retains its original wooden reversible seats. From the 1920s the upper saloons of new cars were equipped with leather seating (mostly brown, but occasionally blue). The photograph looks towards the sliding door to the balcony (on the right) and the 180⁰ turn stairs at the left. Left: 395, seen from above, showing the wooden slatted seat on the balcony. The door to the saloon is closed. The route indicator displays 78 (to Short Heath) and immediately above is the ‘pigtail’ (hook) through which the trolley rope passed when this end was the rear of the tram. This showed that 395 was authorised to pass under the low railway bridges at those locations which were prohibited to certain classes of car. Right: The circuit breaker (left) and bell (right) above the end platform. 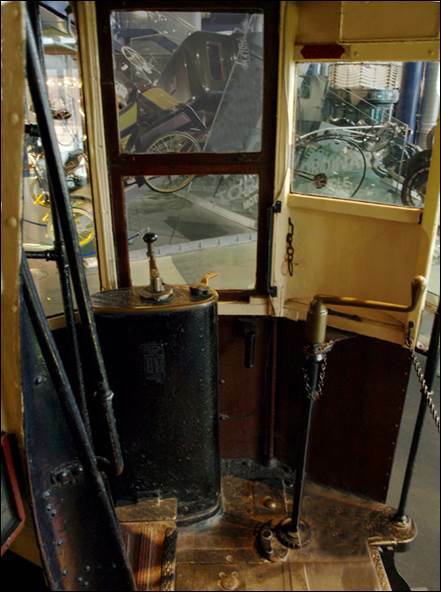 The circuit breaker would cut out, stopping the tram and extinguishing all lights, in the event of a power overload – such as on an over-enthusiastic start uphill by the driver. 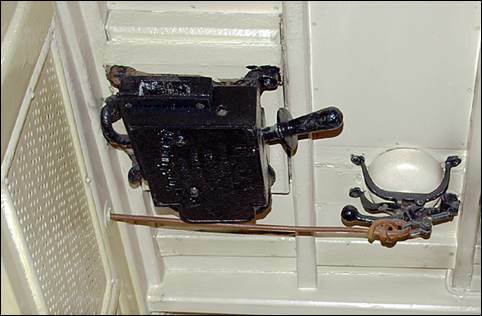 The bell was not electric but operated manually when the conductor (or a passenger) pulled on the cord which passed the length of the tram. Later cars had bells operated by air pressure from a handsome brass bell-push on the far platform. 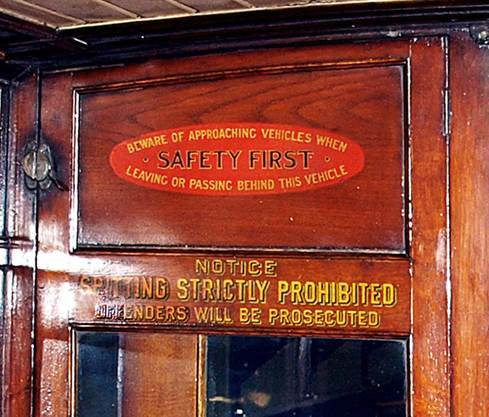 On one of the bulkheads at the end of the lower saloon a poster was mounted with three columns of small print containing bye-laws relating to conduct of passengers and certain operating requirements, notably speed restrictions. Here are a few excerpts to give an idea of the instructions. One wonders what would have been the reaction of a driver if a passenger had opened the door to the platform and pointed out that the tram was exceeding the laid down speed limit! Note that the instructions had been signed by Cyril Hurcomb (1883-1973), an Assistant Secretary at the Ministry of Transport, who in 1948 became the first Chairman of the British Transport Commission, having Britannia class steam locomotive 70001 named after him in 1951! 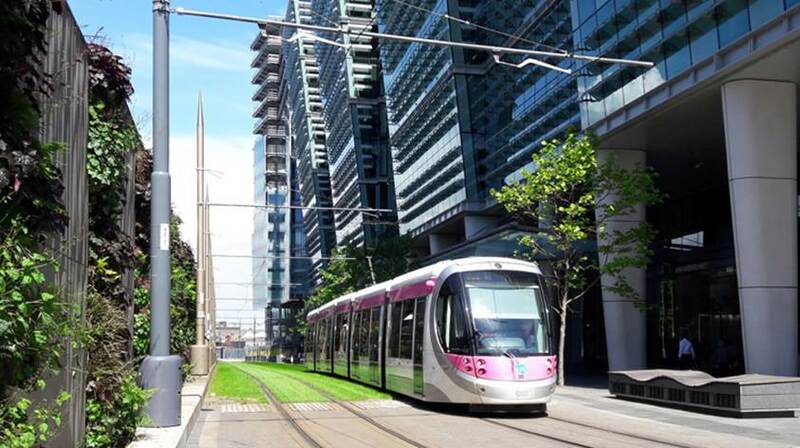 Trams returned to Birmingham on 31st May 1999 with the opening of the Midland Metro which used the former Great Western Railway route from Birmingham Snow Hill to Wolverhampton. The trams terminated within Network Rail’s Snow Hill station (which had reopened on 5th October 1987) until 6th December 2015 when they were diverted to a new tram stop in Bull Street, thus bringing trams back onto the city’s streets for the first time since July 1953. 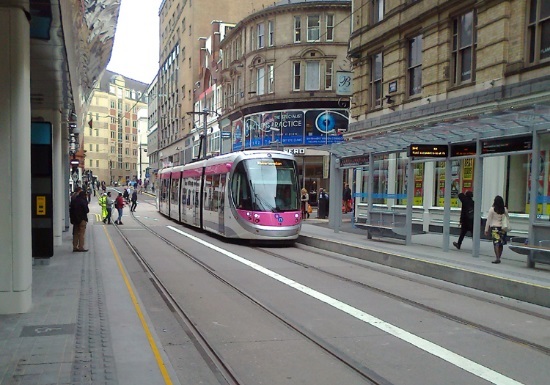 The tram route was extended via Corporation Street to a terminus at Grand Central, adjoining New Street station, on 22nd May 2016. 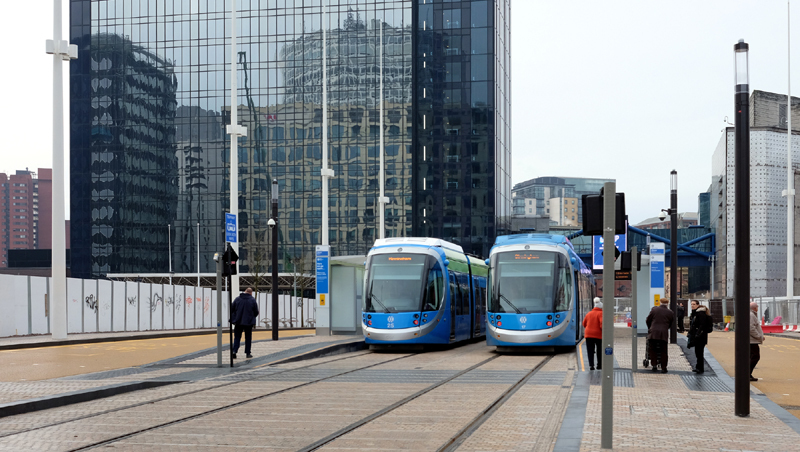 Here are some photographs of the new route in central Birmingham. In summer 2001 tram number 02 pauses at St Paul’s en route to Snow Hill which can be seen in the right distance. A main line train from the Worcester direction is also approaching Snow Hill. fleet and car 02 would have been 845! Sixteen years (2017) on from the previous photo, the skyline around Snow Hill has changed dramatically. Car 31 (one of 21 CAF Urbos 3 trams) approaches St Chad’s stop, named after Pugin’s Roman Catholic Cathedral seen at the left. bed in the foreground to enter Snow Hill station. 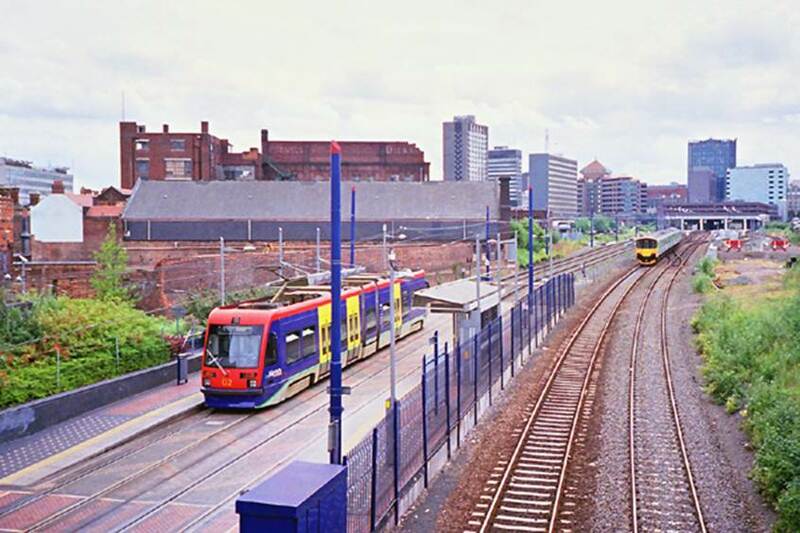 Two scenes at the Snow Hill terminus used by the trams from 1999 until 2015. Left: in 2014 car 11 (repainted in an approximation of Birmingham Corporation’s tram livery until 1953) has just arrived. Snow Hill main line station are to the left. which ran parallel to the GWR platforms. left of the tram and is now occupied by offices. the street. 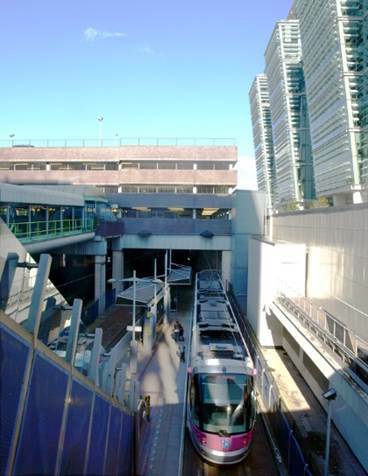 The entrance to New Street station is behind the pillars at the left. 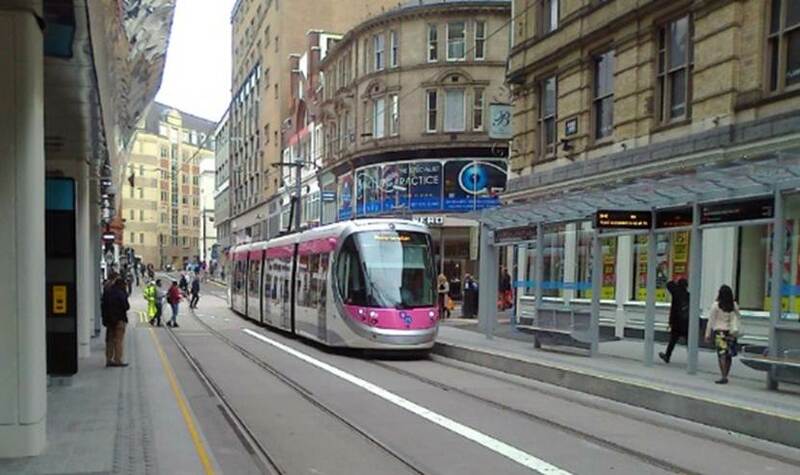 Trams in Corporation Street once more. Alum Rock set off from Martineau Street, swinging sharply into Corporation Street to take the course here being followed by car 35. Great Britain, including the Midlands, Wales, the West Country and Scotland. There is also a chronology of railway history in the West Midlands from 1954 to the present day. 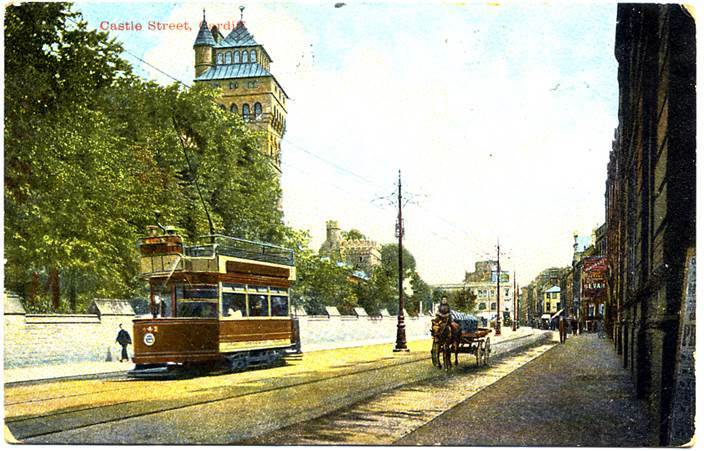 A postcard showing a tram running past Cardiff Castle. The card was sent to my great aunt in July 1904 when the service would have been quite new. 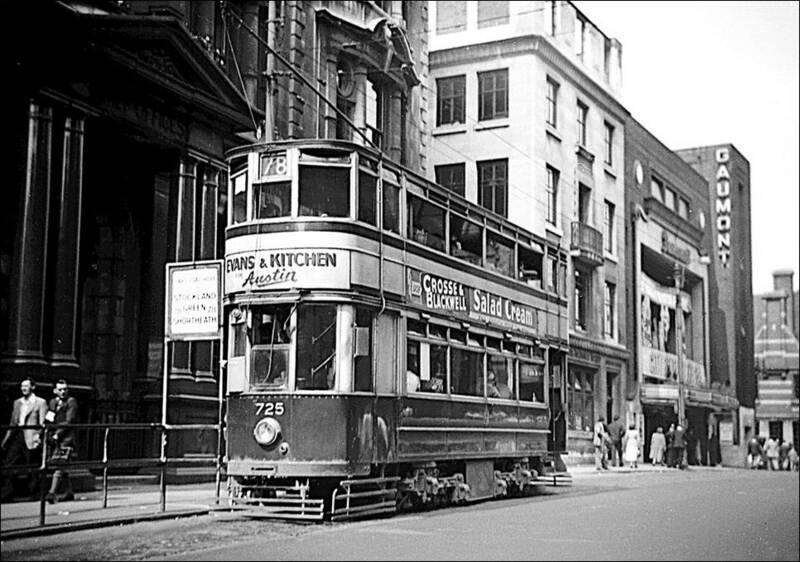 I saw Cardiff’s trams on several occasions, but they ceased running in February 1950. 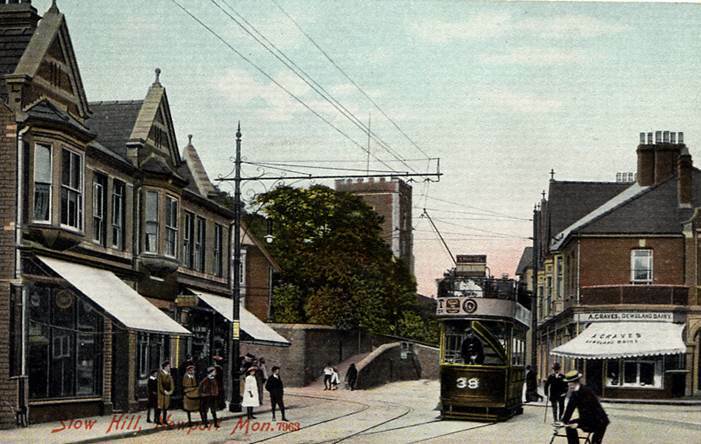 This card, showing a tram in Stow Hill, Newport, Monmouthshire, is undated but probably dates from much the same period as the Cardiff photo. Newport’s trams were withdrawn before the war. A tram at Bathford on the service from Bath. This postcard was sent by a lady in Bath to her friend in Bristol on December 21st 1908. Bath’s electric trams ran from 1904 to 1939. Dudley, Stourbridge & District tram 43 running on the Kinver Light Railway alongside the Staffordshire and Worcester Canal. This postcard was sent to my great-grandmother on July 20th 1914, when Europe was poised to descend into war, bringing to an end the gentle world to which she and her family had been accustomed. 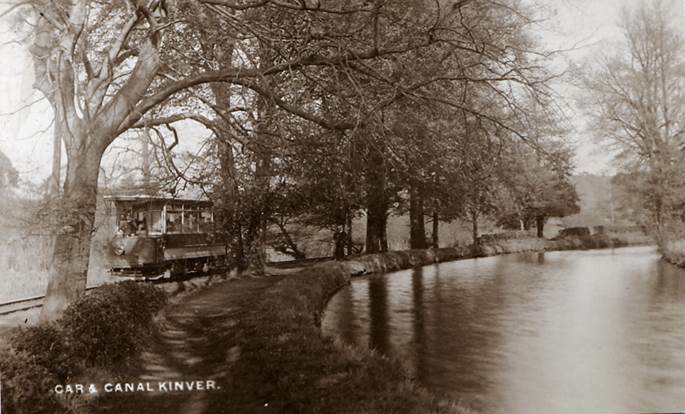 The Kinver line (of 3’6” gauge, like the rest of the Birmingham and Black Country network) opened in 1901 and closed in 1930 but parts of the rural section can still be discerned with occasional rails still in place. The 4¼ mile long line was popular with trippers visiting Kinver Edge, and the persistent traveller could reach Kinver from the centre of Birmingham in about two hours, with changes of car at Dudley and Stourbridge. 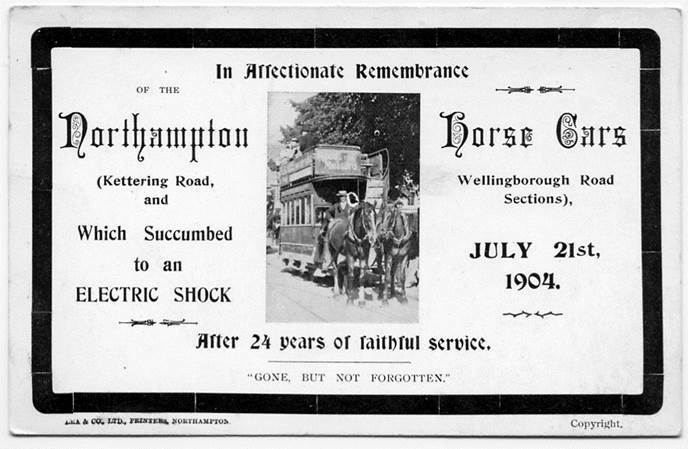 A card issued to commemorate the replacement of Northampton’s horse-drawn trams by electric cars in 1904. Such cards were widely issued in different towns and cities and it is not clear if the photograph is of an actual Northampton tram. Now for a few railway scenes …. 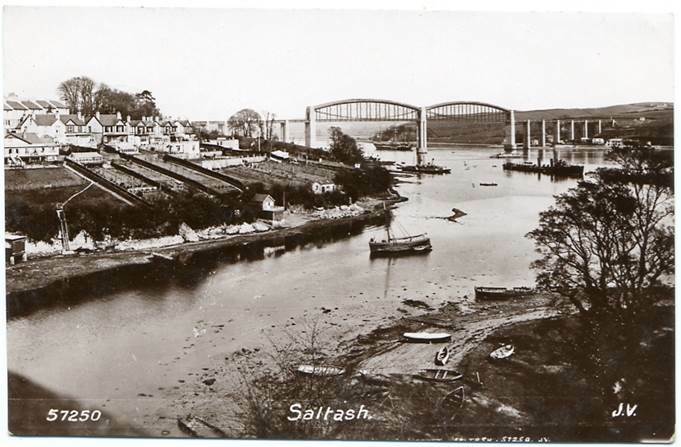 The Royal Albert Bridge at Saltash: note some of the interesting shipping in the middle distance, including what appears to be a wooden naval vessel framed by the arch of Brunel’s bridge. 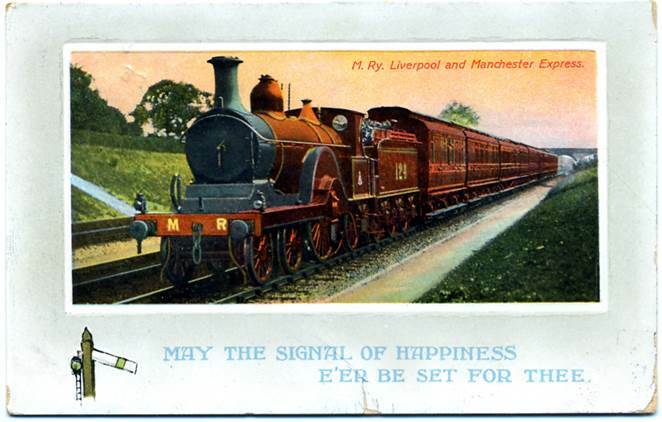 A card of the Rhyl Miniature Railway, sent by my father to his cousin in 1913, (“Today is rather wet”). 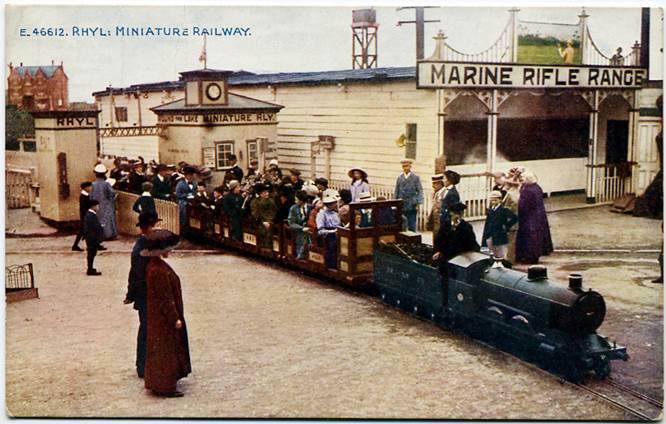 The railway still runs in 2012, offering a fine ride around the Marine Lake. 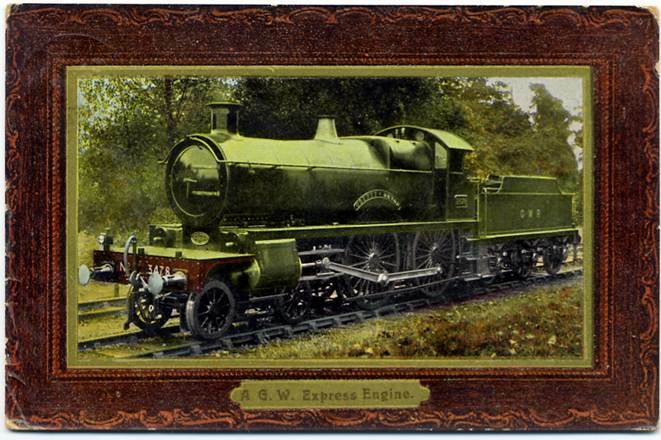 A card showing Great Western Railway 4-4-0 3478 County of Devon. The photo was taken in 1904 when the locomotive was newly built. A greenish tinge has been applied to most of the loco and foliage, and red to the buffer beam, leaving just the wheels in the original black and white! The card was sent from Cheltenham on May 20th 1909 and the writer (an aspiring teacher, perhaps) mentions going for interviews at colleges in Birmingham, London and Wimbledon. A fine view, tastefully coloured, of a Midland Railway express behind one of the elegant Johnson 4-2-2 locos. The card was sent on February 7th 1910 from Ottery St Mary in Devon – far from the haunts of such locos! Penmaenpool on the Cambrian Railways line from Barmouth Junction, showing the loco shed in the distance. The railway closed in 1965, but the George Hotel survives together with a preserved railway signal. This page updated 23rd September 2017.